MAKING A SPLASH - sibling swimming duo Spencer and Beatrice Ben-Scully are creating real waves in the sport. The pair, who both study at the LeAF Academy, are winning competitions in the pool and on the open water. 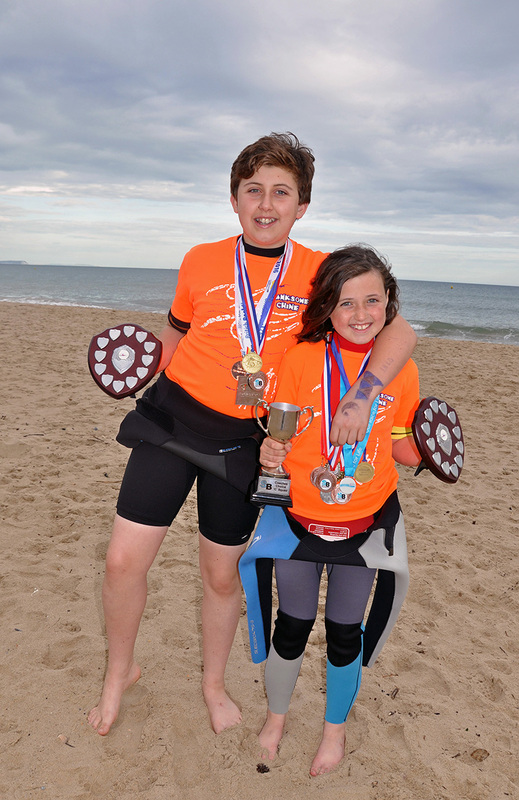 Sporty siblings from Bournemouth are making a splash in the worlds of swimming and surf lifesaving. Spencer and Beatrice Ben-Scully, who attend schools in the LeAF Academy are winning competitions in the pool and out in open waters. Aged only 13 and 9, the pair are set to face their biggest challenge – competing next month in the National Open Water Championships at Exmouth. As members of both the Branksome Chine Surf Life Saving Club and Swim Bournemouth, the youngsters train every week and between them have notched up seven silver and gold medals. Jo Fish, principal of the Elm Academy where Beatrice goes to school, said: “Beatrice is an incredible young lady, full of diligence and determination. And Nadine Lapskas, principal of the LeAF Studio for developing athletes, added: “The talent certainly runs in the Ben-Scully family, and Spencer will be joining our athlete programme from September. Spencer, as a part of the team of four U13 boys, was placed fourth overall in this year’s indoor nationals. Also in the indoor nationals, he achieved a silver medal in the boys’ U13 100m relay and two silvers in the Wessex Open water championships in 2015. Beatrice’s endeavours have added to the Ben-Scullys’ medal haul. In the indoor nationals Beatrice won silver in the Mannikin pull 50m and two golds and a silver in the Wessex Open Championships 2015. Branksome Chine Surf Lifesaving club is a voluntary organisation involved in actively lifeguarding and promoting sea/surf safety in and around Bournemouth and Poole. The club is for swimmers aged eight and above and last year awarded both Spencer and Beatrice The Pratten Nipper achievement award for swimmers aged eight to 13. In August, the siblings will compete in the National Open Water championships at Exmouth, which attracts around 1,000 swimmers from 65 clubs. As part of the Nippers category, they will compete in a 200m open water race, a board race and a running-swimming event.